Last week I bought bananas thinking I would make a batch of Banana Brownies. Life got a tad busy and the bananas went past the point of no return for their intended purpose. 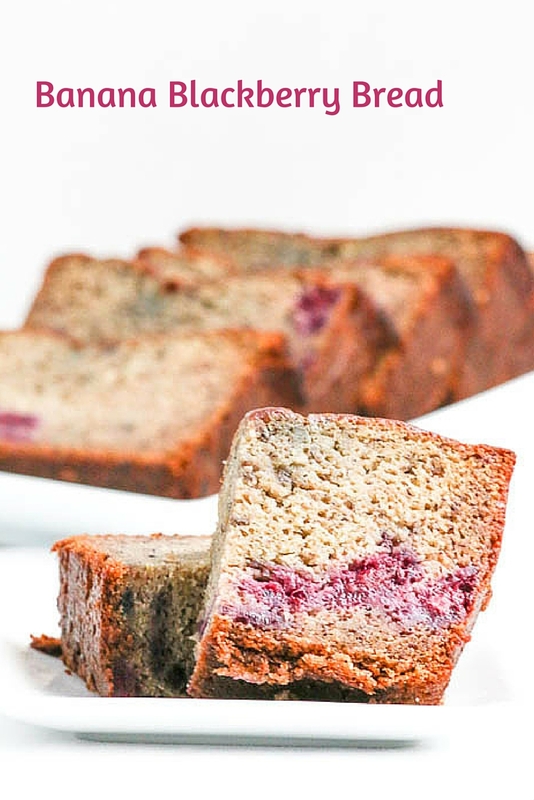 Then I saw beautiful blackberries in the store and decided that Banana Blackberry Bread would be a wonderful alternative to Banana Brownies. I cooked the blackberries on the stove because I find they tend to look pretty pathetic when baked fresh into a cake. Once the blackberries cooled, I folded them into the batter. It is a personal preference whether or not you fold the blackberries in completely or lightly swirl them with the banana batter. 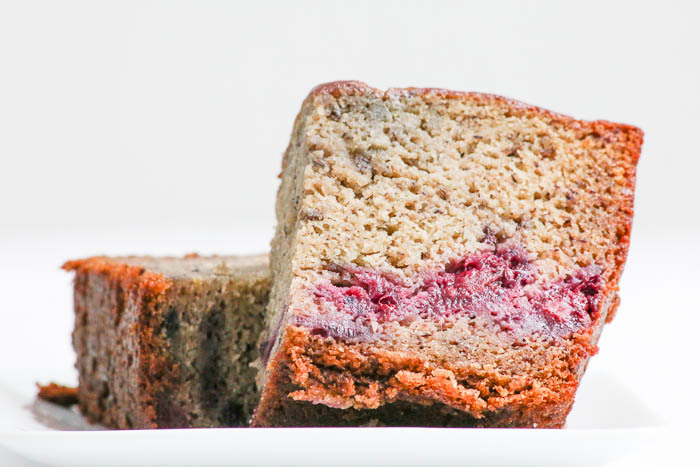 Either way, Banana Blackberry Bread is divine to eat warm or cold. Toasted with some butter on top is terrific, as well. 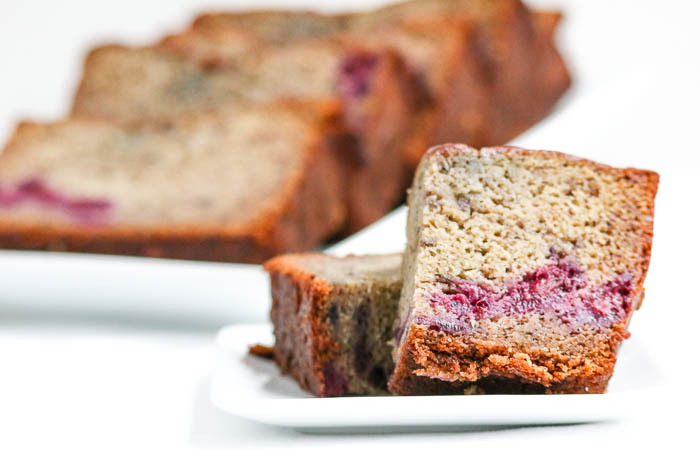 Give Banana Blackberry Bread a try and then let me know which way you prefer eating it! Place the blackberries, ⅓ cup sugar and cornstarch into a medium size saucepan. Smash some of the berries and cook over medium high heat until the mixture is thickened. Set aside to cool completely. Preheat the oven to 350°. Line a 9" x 5" loaf pan with parchment paper and set aside. Place the butter, bananas and 1¼ cups sugar into a large mixing bowl. Beat until the mixture is blended. Add the eggs. The mixture will look curdled but it will come together soon. Blend in the dry ingredients followed by the vanilla and sour cream. Either fold the blackberries in completely or lightly swirl them with the banana batter. Transfer the batter to the prepared pan. Bake at 350° for 1 hour. Cover after 40 minutes if the top is getting too dark. Do you always have to cook the blackberries first? I make banana bread often. (Too many ripe bananas in the house.) what would happen if the berries were not cooked and folded in raw? You don’t have to cook the blackberries. Delete 1/3 cup sugar and the cornstarch as they are there when cooking the berries. Can’t wait to see your bread!